The last Open Streets event of 2016 is this Saturday! 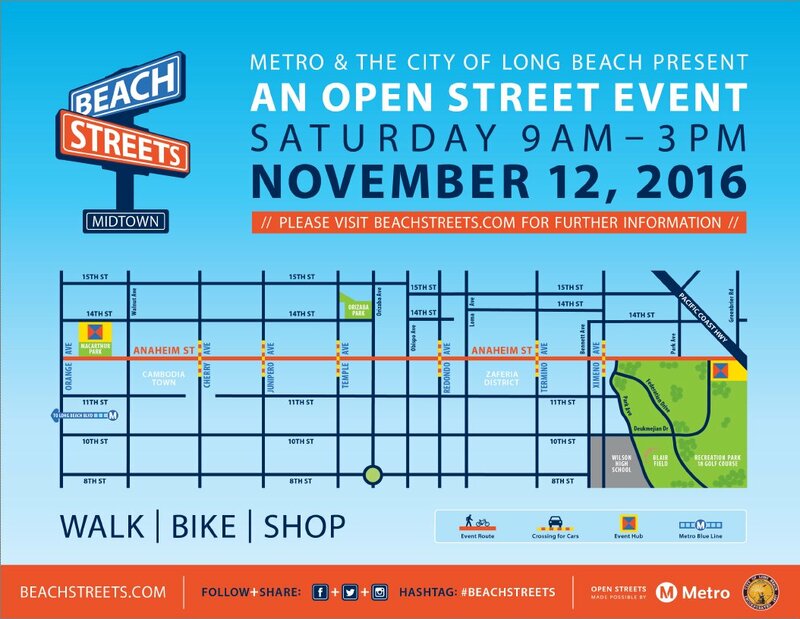 Come out and enjoy all the festivities at Beach Streets Midtown in Long Beach. The route will be along Anaheim Street from Orange Avenue to Pacific Coast Highway. Streets on the route will be off limits to cars from 9 a.m. to 3 p.m. Instead they’ll be open to bikes, skates, scooters, skateboards, roller-blades and pedestrians. There will be free skateboard lessons, roller derby demonstrations, yoga, a martial arts demonstration and a lineup of bands. There will also be an urban cyclecross that will offer an obstacle circuit course skills track for adults and a special version of the track just for kids. If you live in Long Beach, you can try biking, skating or walking to Beach Streets Midtown. You can also get there via transit. Long Beach Transit and Metro both have stops near the event. The Anaheim Street station on the Blue Line is closest to the route and there will be protected bike lanes on Anaheim Street from Anaheim Street Station. Beach Streets Midtown marks the first of the Cycle Two Open Streets events. The Metro Board in September approved 17 new Open Street events through Dec. 2018. Metro has funded 10 similar events over the past two years and Metro’s Open Streets program is the largest in the country with more than 70 miles of car free streets in 2016. These events are great opportunities to have car-free days and explore alternatives to driving. It’s an exciting time to walk, bike and roll in LA. Wowwoohoo 70 miles in 2 years!!! You do know that Bogotá, the origins of Ciclovía, does more than that every Sunday, right?